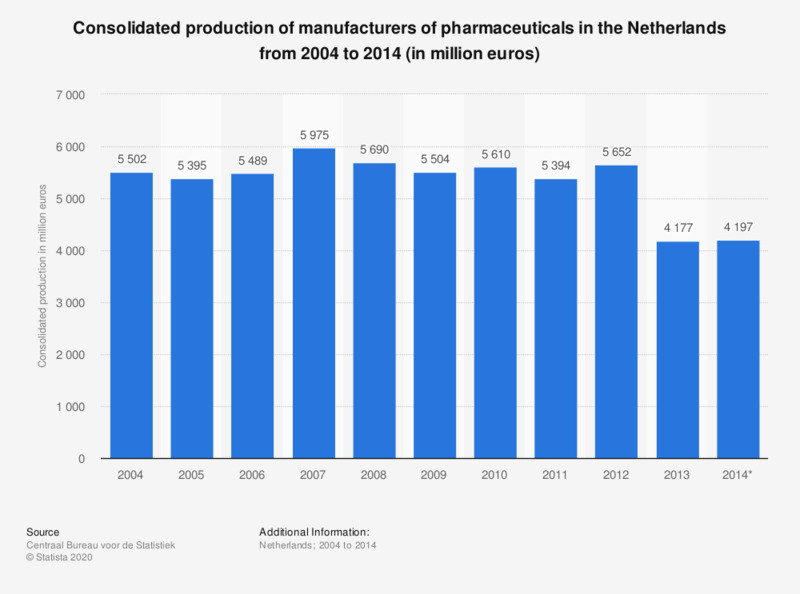 This statistic shows the consolidated production of manufacturers of pharmaceuticals in the Netherlands from 2004 to 2014. It shows that in 2014 the consolidated production was worth approximately 4.2 billion euros. The source defines consolidated production as: "production in a given year minus internal deliveries. The production remaining when a unit (industry, branch, commercial sector) is described as one single company." The source adds: "the official SN calculations use an ex ante interest rate based on the internal reference rate of banks and a risk premium for calculating capital services. The model allows for profits to be made as opposed to the neoclassical model." * The figure for 2014 is provisional.